Originally trading as blacksmiths and wheelwrights, the forge was founded in 1893 in the United Kingdom by Henry Hungerford Barrett and is still owned and operated by the Barrett family. The heart of the business is now in historic Hosmer, East of Fernie in the Canadian Rocky Mountains, where a purpose built workshop has been established to address the custom blacksmithing needs of the Elk Valley. David Barrett, an engineer and fifth generation smith and his wife Sandra are both qualified British blacksmiths. The beautiful and functional working environment enables them to design, make and install quality hand made products at an affordable price. Using modern welding and plasma cutting equipment and traditional coke fired hearth, Fernie Forge makes all manner of things from forged and fabricated metal. 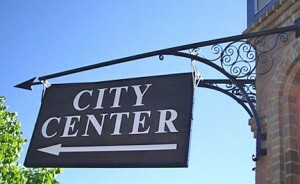 Sign commissioned by the Fernie City Council. 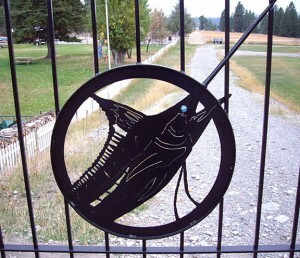 Plasma-cut Marlin. Detail from a pair of gates. 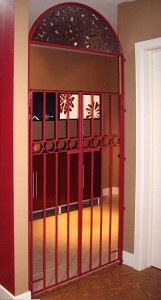 Interior gates with plasma-cut flower arch. Designed for optimum viewing of the church sanctuary from the balcony, polished bronze twisted bars, copper clips joining the double steel bows and copper rivets add elegance to the otherwise understated pattern inspired by gates on the Royal Balmoral Estate in Scotland. 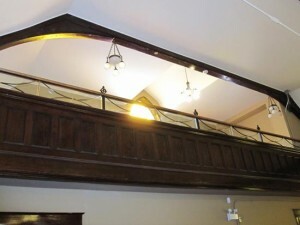 The railings are divided into five panels to echo the symmetry of the existing five windows on each side of the church. Each panel is divided into two with a twisted bronze square bar between the double bows of waxed steel. 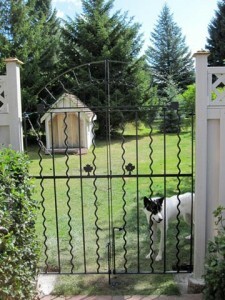 Small solid steel balls positioned underneath the bottom rail prevent flexing along the total length of 38 feet. The Holy Trinity is represented by the stylized fleur de lys at the top of each drop forged cross. The crosses were imported from England to compliment the design, and have been embellished by hand with 23 carat gold leaf by Fernie Forge to highlight the symbolic four corners of the world. A natural wax finish has been applied to enhance and protect all the metal components. 6mm tempered glass panels fit within a groove on the underside of the clear fir wood top rail and are a safety feature to ensure the railings comply with the Building Code. 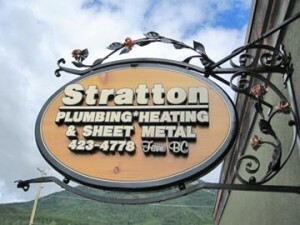 The railings are in keeping with the style of the 100 year old building. 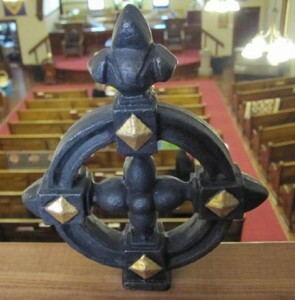 Fernie Forge has designed, made and installed new railings in 2009 to commemorate the centennial of Knox United Church in Fernie. 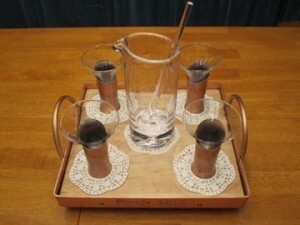 This cocktail set was made and donated to the Fernie Hospital Gala auction for their theme of elegant spies. Six copper roses were included in a sign hanging bracket as the plumber’s wife is called Rose. The Tyne Bridge in Newcastle is included on these gates together with the sun rays on the BC flag.